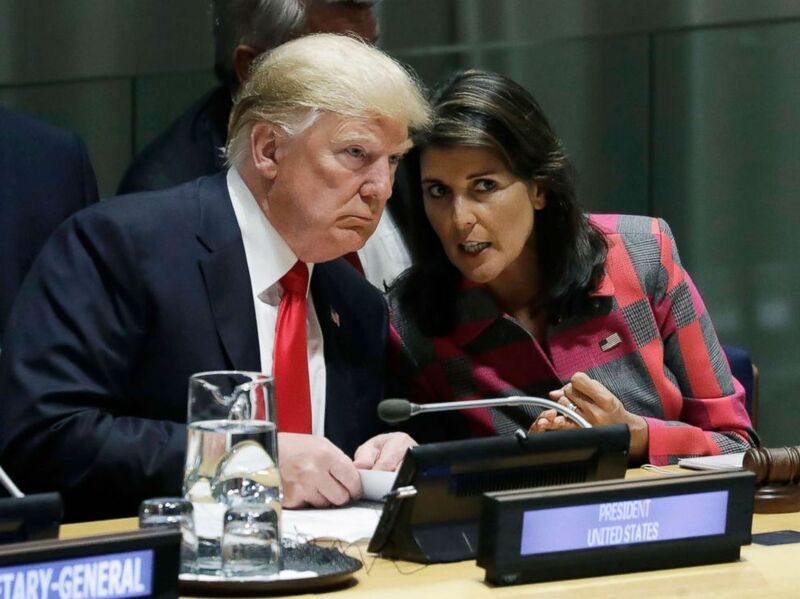 President Donald Trump announced that Nikki Haley has resigned as the U.S. ambassador to the United Nations and will be leaving her post at the end of the year. During a meeting in the Oval Office on Tuesday, Trump said that while he is sorry to see Haley go, she had told him in advance that she wanted to take a break after having served for two years helping advance the administration's foreign policy agenda. Haley also reportedly told her staff that she intended to resign, according to one State Department source. U.S. Ambassador to the United Nations Nikki Haley speaks at a press briefing at U.N. headquarters in New York, July 20, 2018. Haley pointed to accomplishments over the past two years ranging from talks with North Korea about denuclearization, improving dialogue with Russia, moving the U.S. embassy to Jerusalem, and taking a harder line with Iran. She added that she relished going into meetings with foreign leaders with "body armor every day to defend America." "It has been an honor of a lifetime," Haley said. "Now the United States is respected. Countries might not like what we do, but they respect what we do. Now if we say we're going to do something, we follow through...whether it's the chemical weapons in Syria, whether it's with NATO and other countries have to pay their share, whether it's the trade deals, which has been amazing. They get that the president means business and we follow through with that." Haley's departure brings her career with the Trump administration on the world stage full circle. 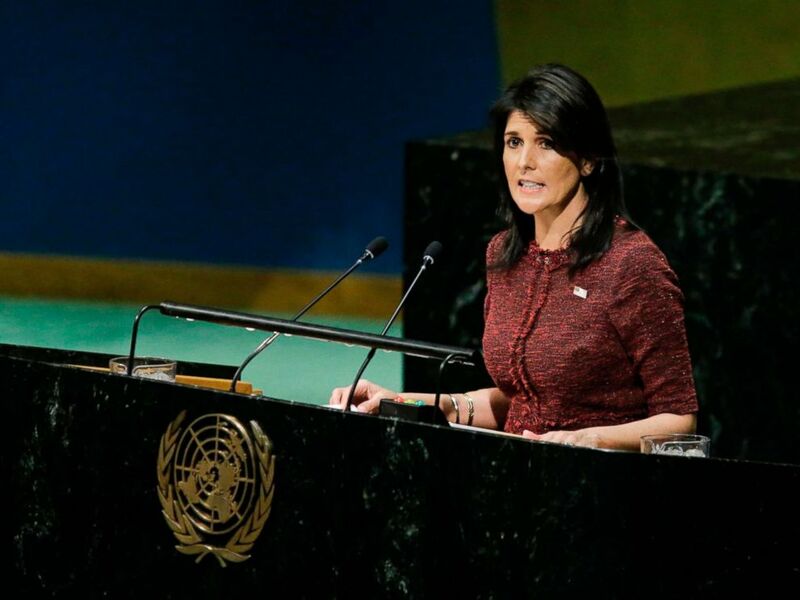 In December, she famously told countries critical of America's decision to move the U.S. embassy to Jerusalem that “the US will be taking names” of countries who vote in favor of a U.N. resolution criticizing the move. President Donald Trump talks to Nikki Haley, the U.S. Ambassador to the United Nations, at the United Nations General Assembly at U.N. headquarters, Sept. 24, 2018. 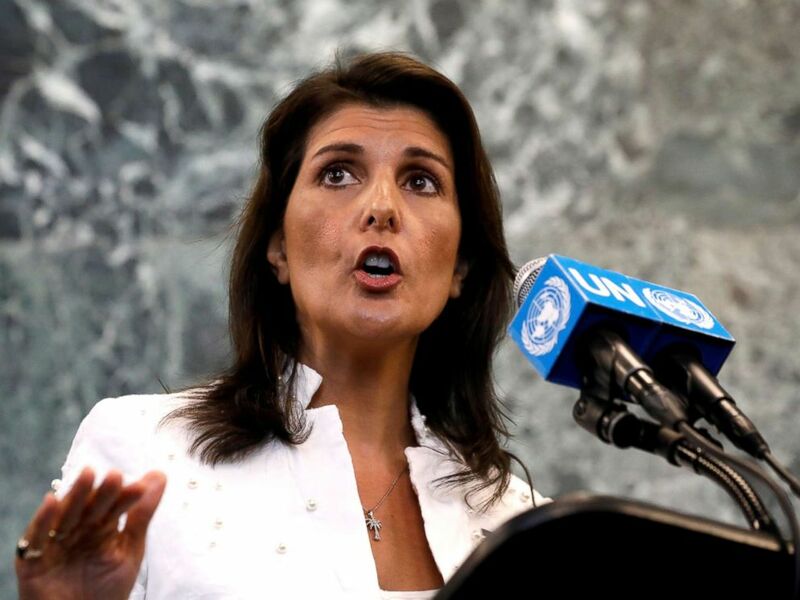 Long rumored as a potential presidential candidate, Haley shot down that speculation and said she planned to campaign for the president during his re-election effort. She echoed that pledge in her resignation letter, a missive which was dated Oct. 3, and which ABC News has obtained. "I will once again become a private citizen," Haley wrote of her life after her U.N. post tenure ends. "I expect to continue to speak out from time to time on important public policy matters, but I will surely not be a candidate for any office in 2020. As a private citizen, I look forward to supporting your re-election as President and supporting the policies that will continue to move our great country toward even greater heights." With Haley's resignation, she joins the list of Trump administration officials to leave after less than two years in office.